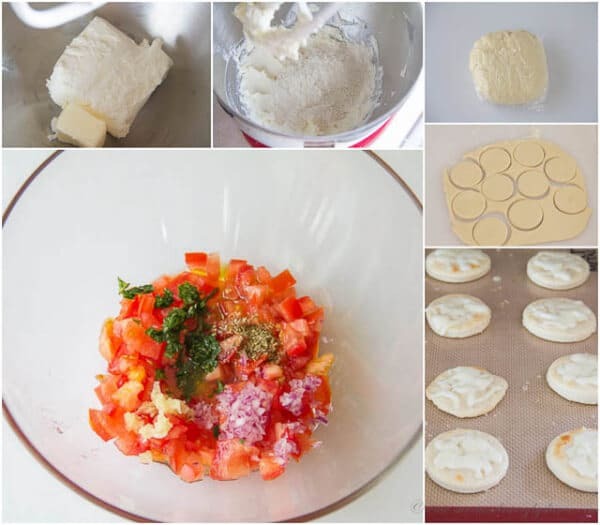 Do you love tomato/basil bruschetta? If you do, you will love this pizza version of the popular Italian antipasto. 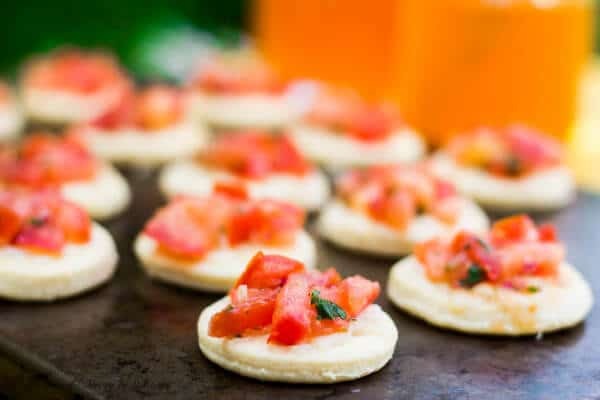 These mini bruschetta pizzas are hands down my favorite appetizers! It bursts with fresh flavors! Fresh tomatoes, fresh basil, melted cheese, and soft cream cheese crust. What’s not to love about it, right? I’m using the same cream cheese dough recipe from KitchenAid booklet that I used here. 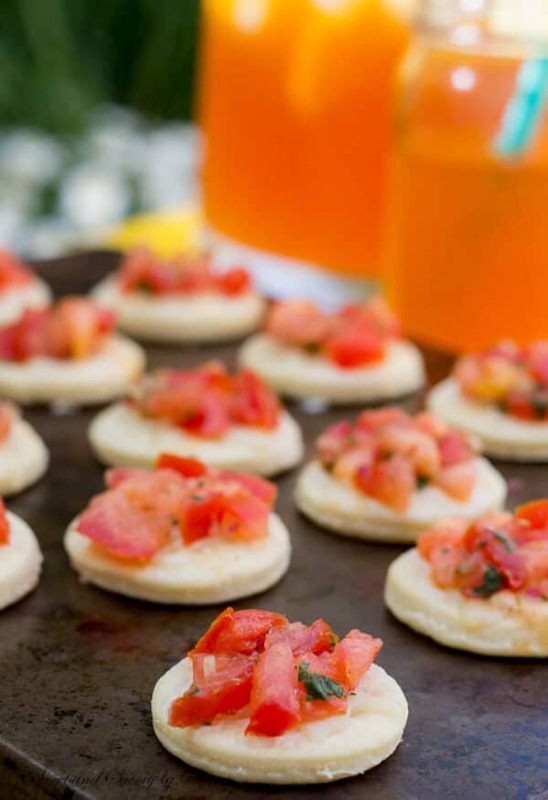 It’s soft, flavorful and perfect for these mini pizzas. The rest is pretty straight forward, just follow the recipe and you will get absolutely delicious snack, appetizer, or whatever you wanna call it. All of my taste testers loved it. No one made a single suggestion, or requested to change anything. Absolutely perfect summer flavors in one! Try it! 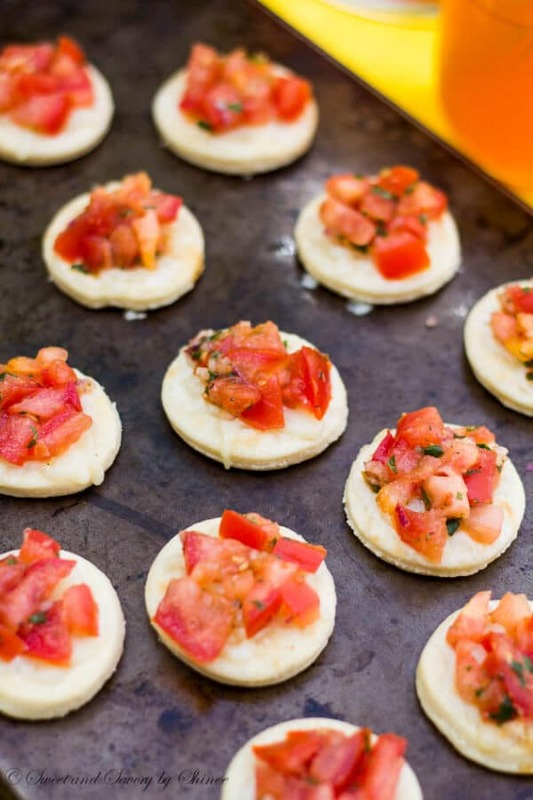 Each bite of this mini bruschetta pizza bursts with flavors from fresh tomatoes to slightly spicy basils, from soft crust to melted mozzarella. 1. In a mixing bowl with paddle attachment, beat the cream cheese and butter until fluffy. Add the flour and mix until dough comes together. Wrap the dough into a plastic wrap and refrigerate for 30 minutes. 2. Meanwhile, dice the tomatoes and roughly chop basil leaves. In a medium bowl, mix together diced tomatoes, minced red onion, minced garlic, basil leaves, olive oil, oregano and salt. Set aside to marinate. 3. Preheat the oven to 350 degrees F (177 degrees C). 4. On lightly floured surface, roll the chilled dough into 1/8-inches-thick circle. Cut out 2.5-inch circles and place them on a baking sheet lined with silicone mat, or parchment paper. Bake for 15-18 minutes. 5. 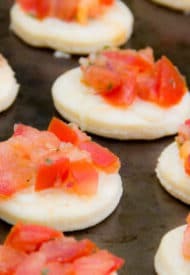 Remove the mini pizza crusts from the oven, sprinkle a teaspoon of mozzarella cheese on each crust and broil for no longer a minute just to melt the cheese. Stand by the oven and keep an eye on it to prevent burning it. 6. 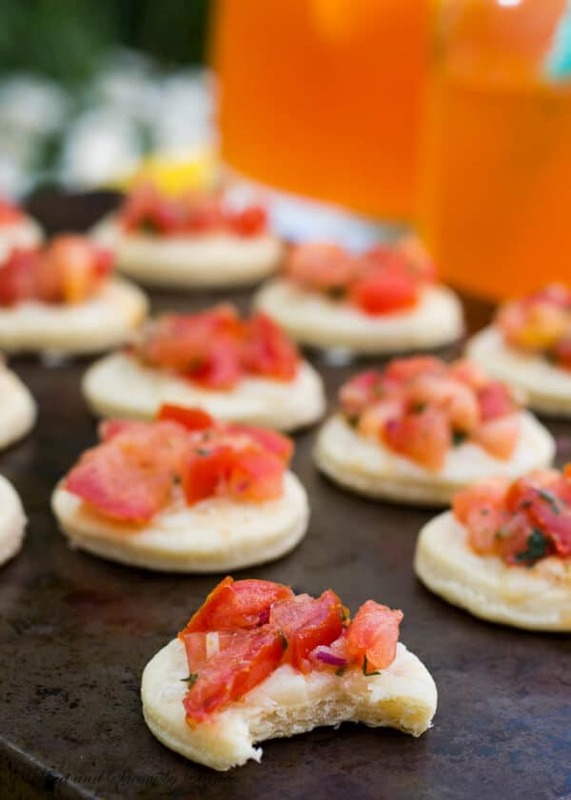 Divide the bruschetta topping on the mini pizza crust and serve immediately.